During the Advent season we often study the life of John and Baptist and his godly parents, Zechariah and Elizabeth. 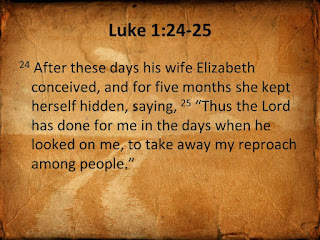 During her pregnancy with this holy child, Elizabeth exclaimed, “Thus, the Lord has done for me in the days when he looked on me, to take away my reproach among people.” (Luke 1:25). What was her reproach? 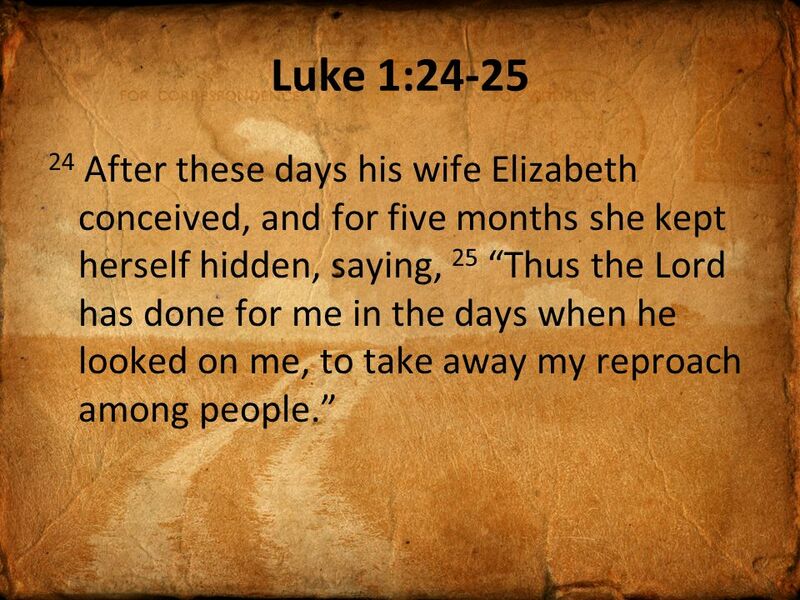 Elizabeth was unable to conceive, and no doubt, she was disdained for this by her society. The worth of a woman in her world and in many cultures depends on their ability to bear children. In some societies male children are the ones that count the most; so not even a female baby is good enough. A woman who has no children is at fault for some reason, even though modern medicine has proven that the husband can also be the cause of the family’s infertility. In the Bible we read of a few other women who faced reproach and were desperate for a child: Sarah, Rebekah and Hannah, to name a few. In our society women are not under the same depth of condemnation if they do not conceive. Women have careers and many kinds of other interests than motherhood. However there is still unhappiness and social pain when a couple who want children cannot conceive for some reason. Reproach of women is not lost on our society. The practice of sexism is a form of reproach. Still today, women get paid less than men for the same work. Most corporations have men as their CEO’s; and sexual abuse and domestic violence mostly happens to women. 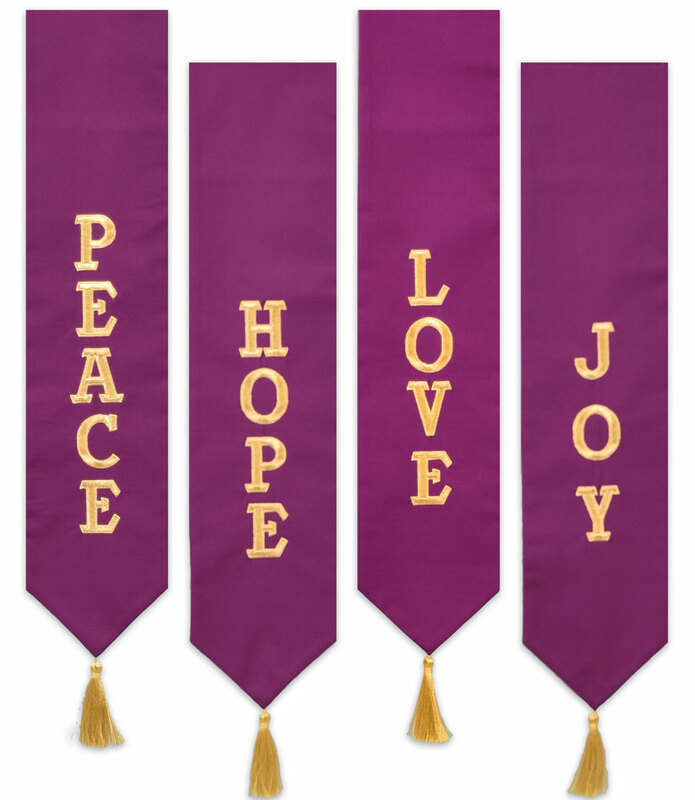 Purple or Blue: What color is your Advent? In recent years we have seen the color blue more and more, in addition to the traditional purple. According to www.umc.org “The Christian year has two cycles: the Christmas Cycle (Advent-Christmas-Epiphany) and the Easter Cycle (Lent-Easter-Pentecost). “Within each cycle are a preparatory season symbolized by the color purple and a festival season symbolized by the color white. After each cycle there is an ordinary time of growth symbolized by the color green. It goes on to say that the color purple represents both royalty and penitence, while blue symbolizes hope. 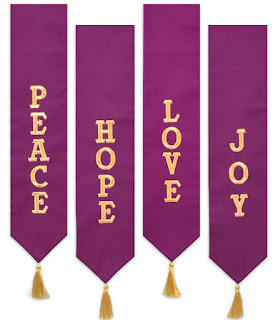 Purple and blue are both acceptable colors to use during Advent. 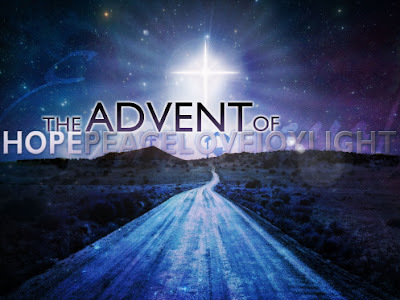 Upon further examination, I found that the shade of blue for Advent is often a deep, dark blue. It is like the color of the predawn sky just before the sun rises. It brings with it the meaning of expectation and anticipation of the coming of the Messiah. Altar design by Karen Barkowski. John Coleman photo. 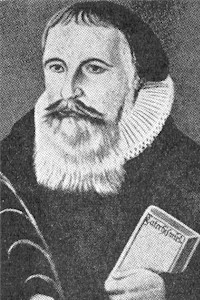 The hymn “Now Thank We All Our God” was written by a Lutheran minister, Martin Rinkart (1586-1649). We sing it often during this season of Thanksgiving in praise of our “bounteous God.” But the backdrop of this hymn writer’s life was filled with death, looking nothing like a Norman Rockwell Thanksgiving painting. Rinkart penned the words of this hymn during the Thirty-Years’ War between Protestants and Catholics. He was one of four parish pastors serving at that time in Eilenburg, Saxony, located in East Germany. But when the war continued to rage on, one pastor left, two died and he alone was left to serve the people. Eilenburg was a walled city. So, it became a place for refugees, and thus, there was a great shortage of food. Then the plague set in, and scores of people died from this dreaded disease. Rinkart performed 40 to 50 funerals a day, including his wife’s funeral. It was estimated that he buried more than 4,480 people. After the plague came an invading army of Swedes demanding that tribute be paid. The besieged pastor served as the negotiator with the Swedish army; and he paid them the tribute with his own money. When the army refused to leave the town, he gathered the people for intensive prayer. Miraculously, the Swedes departed in peace. 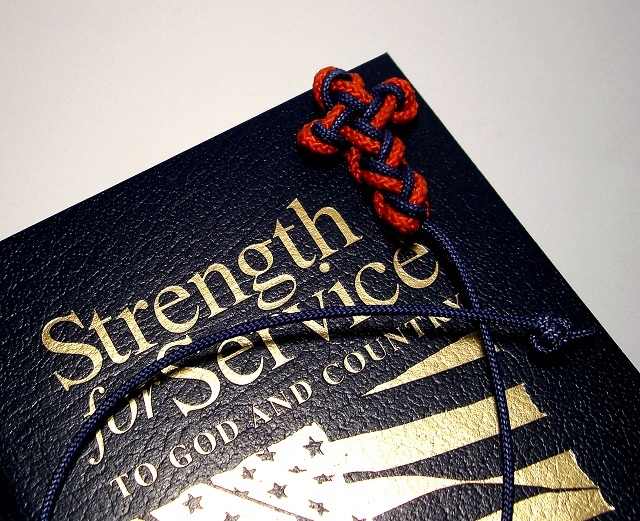 As we prepare for the annual observation of Veteran’s Day, November 11, I would like to call to your attention a wonderful resource produced by our United Methodist Men: Strength for Service to God and Country. This inspirational book comes in two versions. One is for military service men and women. A second version is produced for local emergency service personnel, such as first-responders, police, fire fighters and medical professionals. This resource can be purchased through our General Commission on United Methodist Men at www.StrengthforService.org. Originally distributed during World War II and the Korean War, it was revisited by a Scout named Evan Hunsberger, whose advocacy for the book’s republishing was his Eagle Scout project in 2002. How wonderful it would be if our churches could purchase copies of these devotionals and distribute them to our community servants as well as our men and women in the military. It would be a wonderful way to show honor and appreciation this year during and after our Veteran’s Day observance. 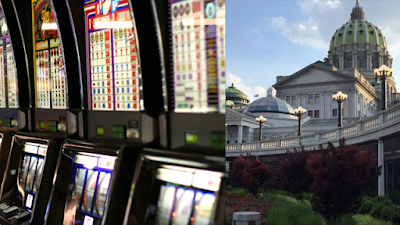 On October 26, the Pennsylvania House of Representatives voted 109-72 to approve a significant expansion of gambling in our state, House Bill 271. The bill was approved by the state Senate the previous day. Four days after the House action, Governor Tom Wolf signed the legislation into law. The legislation was quickly moved, taking only 18 hours between its introduction and its passage in the House. In fact, lawmakers had only two hours to read the massive 939-page bill. This stealthy rush through the General Assembly minimized scrutiny. Obviously, public input was thwarted. This new law will create 10 mini-casinos in regions without a casino, allow some truck stops to operate video gaming terminals, regulate fantasy sports and online gambling, legalize online gambling portals at casinos and airports, permit the state lottery to sell tickets and offer games online, and legalize sports betting (if Congress allows it nationally). Proponents of this legislation hope to open gambling to new markets, especially younger players. Only Nevada exceeds Pennsylvania in commercial casino revenues. This law marks the biggest expansion of gambling in the state, since it first legalized casinos more than a decade ago. Pennsylvania now becomes the fourth state with internet gambling and the first to allow both casino and lottery games online. Our country is still reeling from the recent incident in New York City where a terrorist brutally ran over and killed innocent people with a truck. Now we learn of another heinous, hateful act of unbelievable violence against innocent people. This time it is in the tiny town of Sutherland Springs, Texas. This time it strikes especially close to home. This time it is in a church, where unsuspecting members—children and adults—were gathered for worship. 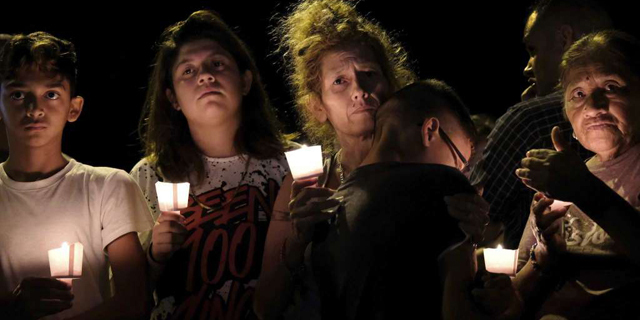 Fifteen seconds of automatic weapon gunfire erupted in a horrific mass murder, the worst ever in an American place of worship and in Texas’ history, killing 26 people and wounding many others. This terrible act of violence has caused profound devastation and inconsolable grief. There are no words that can come close to healing such emotional and spiritual wounds. These prophetic words speak to us this day. As Christians, we are called to pray, to continue to speak out about how to live in this world in nonviolent ways, to examine our weapons laws for ways to be more protective, and to find ways to prepare our churches for the unthinkable. A final reminder is that mental health is often in the mix when people perform horrific acts of mass murder. Our country could and should be doing much more to provide for more mental health services. It is just as important as medical (physical) health care. Please remember that the vast majority of people with mental illness are not murderous or violent, and we as the church need to continually be about the business of ministering to this community with compassion and grace. NOTE: Church Mutual Insurance Company offers several risk control webinars and articles on its website that could be helpful to any church. Please check them out, use this valuable information and share it with other churches. Although catastrophically violent events are not frequent, the consequences are tragic. With the recent rise in active shooter incidents, specifically, many organizations are asking questions about how to make sure they are prepared for such violent events. The Rev. Derrek Belase, a former certified police officer turned pastor, with two degrees in criminology, is the Oklahoma Annual Conference's Director of Discipleship. His current portfolio includes coordinating the Safe Sanctuary Training.Derrek believes that you can’t completely prevent gun violence from erupting. Even with the best laid plans or the best legislation. Then what? How can a church adequately protect itself? Here are seven practical tips that can help any church prepare for the unexpected. Also, the Rev. Dawn Taylor-Storm offers this training opportunity to Eastern PA conference churches: Bishop Johnson is asking for each of us to set up Active Shooter Training Workshops (“What churches should do”) on each of our Districts. The Rev. Mark Beideman will lead a South District training this Sunday, November 12, at 3 PM, at Downingtown UMC. Any district is invited to send folks to our training for now. Mark may be able to come to other districts to offer trainings at other times. Why? Because of some very shocking and disturbing statistics that more people should know and care about. Every 9 seconds in the U.S. a woman is assaulted or beaten, according to www.domesticviolencestatistics.com, a website dedicated to educating the public about this terrible scourge. It’s a worldwide problem. In the U.S., 1 in 4, but globally, at least 1 in 3 women is beaten, coerced or abused during her lifetime. 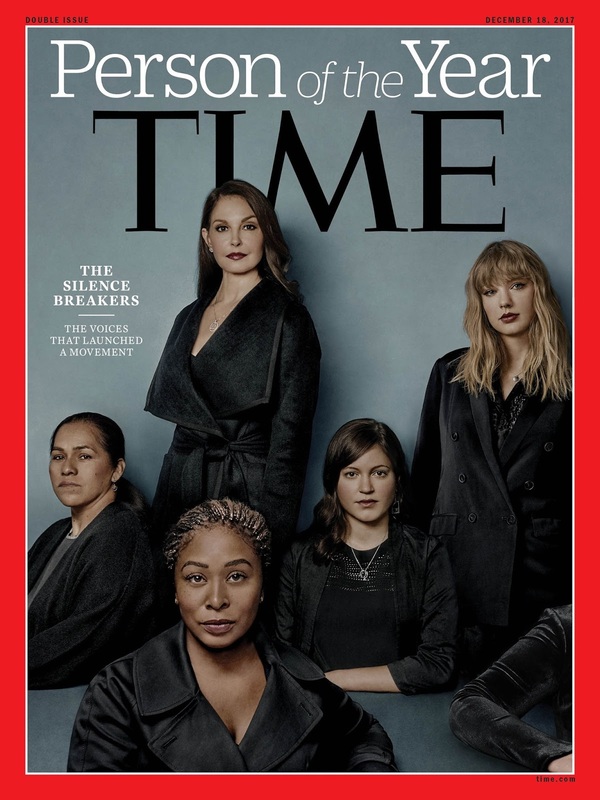 And based on reports from 10 countries, from 55 to 95 percent of women who have been physically abused by their partners have never contacted police, safety shelters or non-governmental organizations for help. Thus, this problem, this burden, is far more devastating—to women, to families, to communities, to our nation and world—than we know. So, October is annually recognized as Domestic Violence Awareness Month to shine a light on a very serious, painful but often hidden crisis in our world. In fact, the National Network to End Domestic Violence (NNEDV) recommends this week as a “Week of Action” in the campaign to end domestic violence. This problem is not limited to only women. Many men and children are also victims of domestic violence. Sadly, it also happens in clergy families and in the homes of countless lay people in our congregations. When I served in a local church years ago I was made aware of a serious abuse situation in the home of a family that lived near the church. When I became involved in an intervention I was fearful for my life as well as the life of this young mother and her two small children. Fortunately for this family there was a local shelter available to help. But I learned quickly that such resources to address this kind of crisis were very limited. The Eastern PA Conference is forming a Domestic Violence Task Force that we hope will become an official conference committee in the future. The purpose of this task force is to educate our churches about this staggering, hidden reality and to refer people to organizations, services and law enforcement officials who can help. This is a compelling burden for us all to bear. We encourage churches to have conversations about Domestic Violence and to ask hard questions when anyone suspects that someone is being or has been abused. We are our brother’s and sister’s keeper. So, we need to open the eyes and ears of our hearts and extend our hands and our voices to offer lifesaving relief. 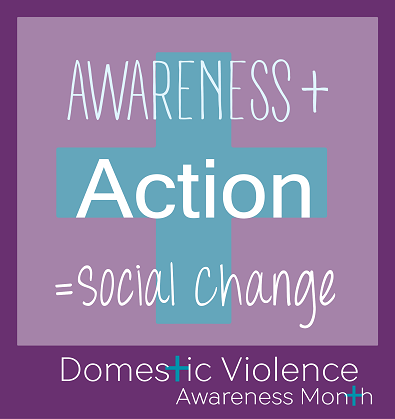 Please search online for more information about domestic violence this month and learn what you and your church can do to shine the light of truth and healing on this widespread problem. And please let us know what your church is doing or plans to do. Thank you. NOTE: Hopewell UMC (852 Hopewell Road, Downingtown, PA) will host Strengthening Families throughout the Faith Community, “an engaging conference for church ministers, staff and lay leaders,” on Saturday, Oct. 21, from 1:30 to 6:30 PM. 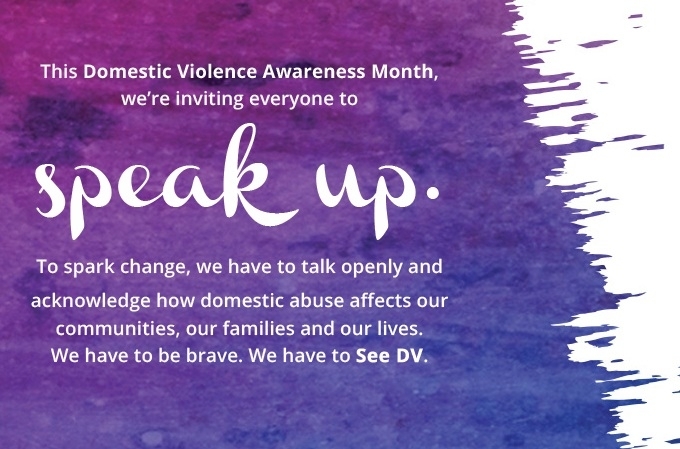 This experience will educate concerned participants about ways churches can connect with community resources to support domestic violence survivors and their children. Please register online today. For information call Courtney, of DVCCC, at 610-431-3546, ext. 134. (0.4 CEU certificates are available.) Download the flyer. This is the week in most annual conferences in the United States known as “transition week.” Pastors who are moving to another assignment typically begin on July 1. 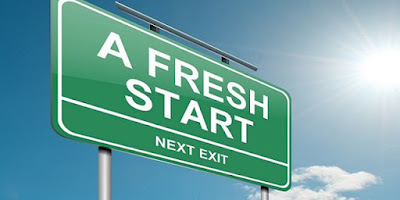 There is a period of welcome and adjustment to a new environment, a new group of people, a new place to live and all the million things that go into a move. Many pastors have spouses and children who transition with them, so it is not just the pastor who has many adjustments to make. Churches too have new things to get used to as they welcome new pastors. And there is often a bittersweet mixture of “good-byes” and “hellos” in the hearts of church members. Churches need to welcome their new pastors and new families with as much hospitality and love as they can muster. Pastors need to leave their churches when they leave their churches, and not continue to have pastoral ties with families in ways that interfere with the ministry of the new pastor. At least a one-year window of absence from all contact is requested, unless one is invited back by the new pastor for some reason. Parsonages need to be left clean and repaired. Pastors should attempt to learn about the new church before changing the worship style and things that people are used to doing. There is plenty of time to make changes, once people get to know the pastor and everyone understands each other. Contact the district superintendent if there are any concerns about salaries or promises made at the pastoral take-in. They are there to help. Remember to pray for our retired pastors who may not be assuming a pastoral assignment in retirement. They are starting a new journey of life and need our support as well. The itinerant system of moving pastors is not perfect, but it has many advantages. The gifts of pastors vary greatly. With pastoral changes churches get to enjoy a variety of expressions of worship and styles of ministry that can bring health, strength and imagination to our congregations. The most important thing is to keep the goal of preaching the gospel and making disciples as the driving passion of the church. God will lead both pastor and church into new, potentially exciting opportunities for spiritual growth and outreach. I had not planned to attend the Philadelphia Gay Pride Parade on Sunday, June 18. Even though it was mentioned in one of our annual conference resolutions as a place that the church should be present, I imagined it to be a secular and not very sanctified event. Since I was leaving to travel to Pittsburgh for an NEJ College of Bishops meeting that day, I was sure that time would not permit me to join the parade. However, God had other plans for my day. My husband Mike was asked to preach at Historic St. George’s UMC in downtown Philadelphia that morning. A member of the church told us the Gay Pride Parade was in walking distance of the church, and it would begin just around the time church service was over. Down 4th Street and onto Market Street we went with our faithful church member, who served as both our walking guide and our interpreter about the LGBTQ community. What I saw was much of what one would expect: a colorful, Mardi Gras-like celebration with much dancing, music, beads and candy tossed to onlookers. What I did not expect were the many floats and marchers who were there as support groups that offer health care, education, family resources, counseling and yes, spiritual guidance--practicing what we so often preach. There were people of all ethnicities, ages, and abilities present. 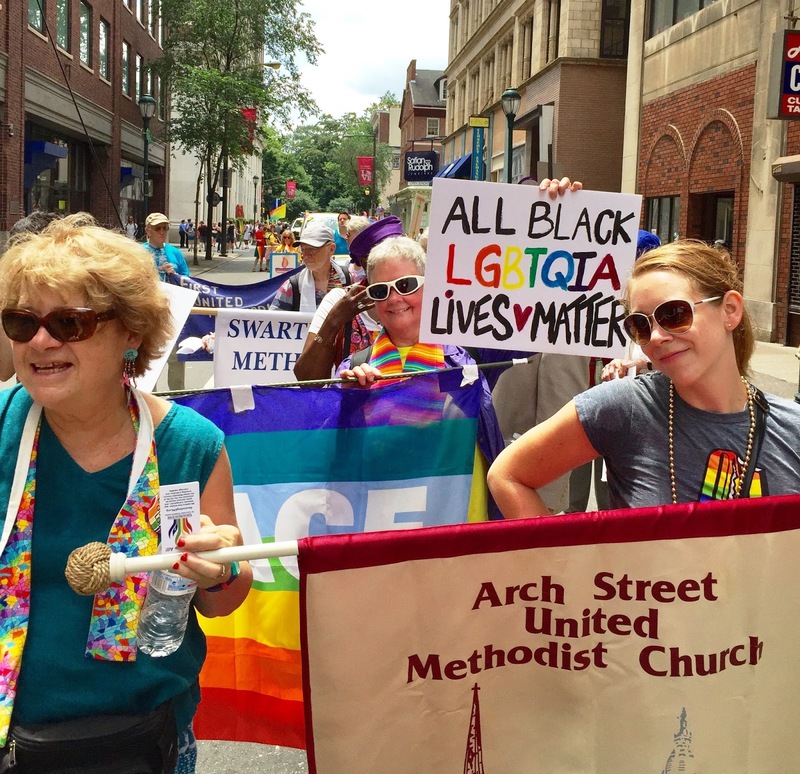 A number of churches and interfaith groups were marching in the parade, including several of our Eastern PA Conference churches. Their message was about being welcome and sharing the love of God with and for all people. I am so glad that the Church—our Church—was present there proclaiming this embracing, life-giving message. 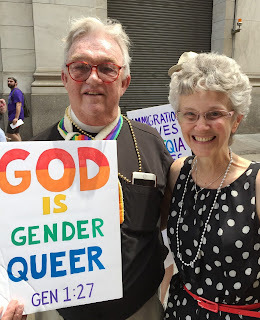 I respectfully acknowledge, with every ounce of my bishop’s heart, that there are Christians of goodwill in our conferences who do not agree about issues around homosexuality and gender identity. Nonetheless, we are mandated by our Discipline to be in ministry with all people, and all means all. All people includes this part of the world’s humanity. God makes the Judgment call at the end of the day, whatever that will be; so it is not our job. For far too long we have been arguing over particulars, authoring and amending resolutions, and speculating about a church schism. But all we are asked to do is simply to love and welcome all people. I encourage all our churches to exercise our denominational mandate to be inclusive. There is grace to be found when you meet and listen to the stories of people who are different from you. Be willing to stretch beyond your “comfort zones” and go there to listen and connect with them. Christ calls us to invite and welcome folks—different folks—into our churches and activities. It means we need to go into communities and engage people where they are—where they live, celebrate, suffer and struggle daily to gain dignity, human rights and loving acceptance. Editor’s Note: At the Eastern PA Annual Conference June 15-17, Resolution 2017-11 encouraged all churches to practice Radical Welcome to LGBT persons. It explained that, “practicing radical welcome can be defined as holding or participating in special events in June (Pride Happenings) and October (Coming Out Happenings) to let LGBTQ people in our churches and communities know that they are welcome in our churches, and by offering special prayers for the LGBTQ people and their families in our churches and communities on a special Sunday in the months of June and October. The resolution further recommended “that the Eastern Pennsylvania Annual Conference invite the Reconciling United Methodists of Eastern Pennsylvania and other interested churches to represent the Conference as a welcoming presence at Pride Parades and Outfests in their communities in June and October 2017. Presenters withdrew the resolution after efforts by some conference members to amend it with deletions during debate.